1st model thread in this forum? I'm all fancy-pantsy and stuff. I made a skeleton human for M&B, so I figured I'd make the horse ...I don't have plans to use it in Hero & Blade. 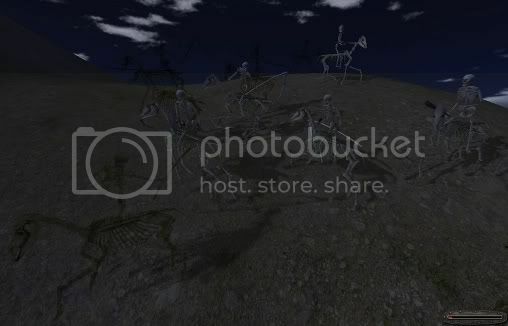 The skeleton troop & skeletal horse can be used in any mod without asking my permission, but PMing me about how you'll use it would be nice. 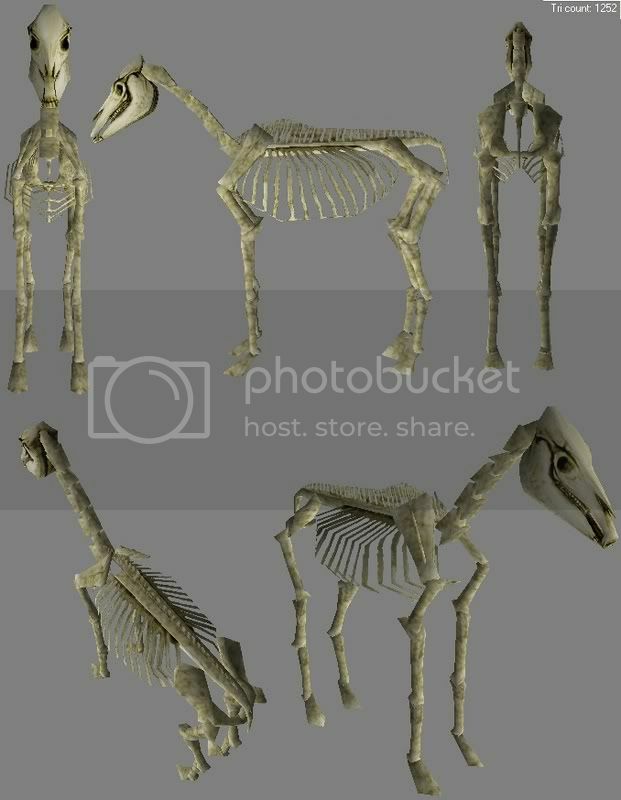 The zip file contains a .brf with all meshes,materials,& textures, and 3 .dds' for a skeleton troop, skeleton horse, & partially transparent skeleton troop and horse. No python lines or anything are included. If you need help putting them in-game, post here or PM. That looks brilliant! Nice job man. Curses! Looks like I'll have to scrap mine then! Great job Cartread. Is it all right to use it in Warhammer Mod? Nice work! I would definitely like to use this in darkmod. Just a thought, but a version with some kind of saddle and reins might be handy for some modders. Thanks Ursca and Ahadhran, I was hoping Darkmod and Warhammer Mod could use it. I don't think reins are possible Winter (they wouldn't be animated), but I'll add a saddle. Okay, added a simple saddle colored in BRFEdit and it's now part of the download. You always supprice me with interesting new ideas and practical solutions. Can you give me some help on putting this in the game as a mount and character choice and a troop. Are you using the module system? Are you just adding it to native or is it for a more specific purpose or mod? Does "character choice" mean a selectable skeleton character from New game start-up? in the same vein...I have been meaning to ask. 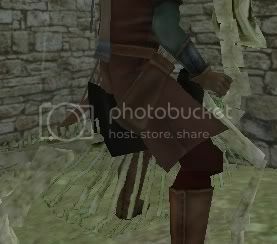 Can the skeleton mesh be used for a player character class now? 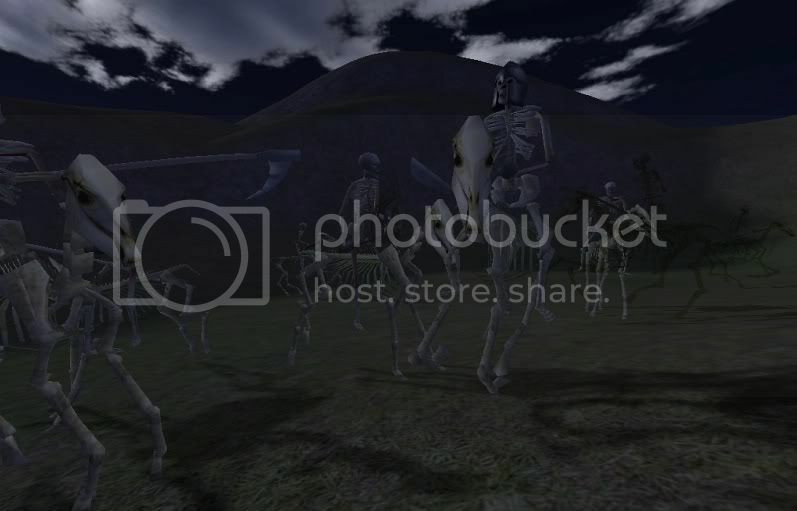 The last time I tried it, you would get a crash every time you viewed the face edit screen, but if you just avoided the face edit screen (didn't click the button in the character screen, and didn't assign the mesh to the player character until after character creation was finished) you could play as a skeleton fine. Just import a new frame for it (export, import append the same mesh). I am not the one setting up the meshes, I was asking if the ones Cartread has already made still cause crashes in the face edit screen. Since the meshes have already prepared by Cartread, there shouldn't need to be any messing around with frames. Shoot, I forgot about that. I haven't done anything with the skeletons in that area. Thanks for reminding me, I'll post back here after I get that sorted out. 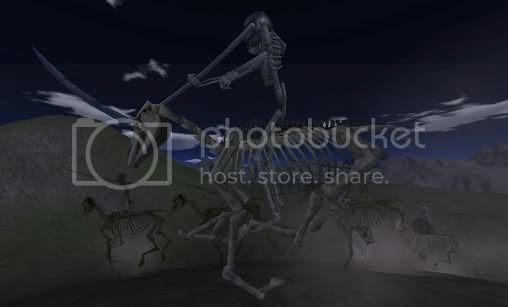 The skeleton_head in the download can be used (un-vertex-animated face is what caused it not to work previously). I didn't want the hair mesh to show up, so I used a tiny 1-triangle mesh, "onepoly." Ah, I was wondering what it was that caused the problem, thats good to know. I was just using notepad. Check all around this and the TaleWorlds forums, there are a lot of modding tools, tutorials, etc. Nice!! You don't mind if I use them for my World of Warcraft mod, do you? And how do you put it in without using Module System because something's wrong with my Module System. I can't use it at all. It says python isnt a batch file and some stuffover and over again. If anyone can tell me how to solve this problem, then yay, I can use this! And is this for all faces or for undead only?